I’ve been hanging out in Gingko Audio rooms at shows since about 2006, and I’ve heard at least umpteen-dozen of their show setups since then. I almost always dig them. I dug them back when they were fashioning cardboard tubes into Tubulus Speakers. I dug them when they were hooking accelerometers up to audio gadgets to sell vibration control gear. And I’ve seriously, seriously, dug them since they upped their game with the ClaraVu 7 Mk 3 speaker ($8,995 per pair). This room? I’m going to say that this was their best yet. Part of that was obviously the LampizatOr Big 7 DAC ($13,500) that fronted the system. 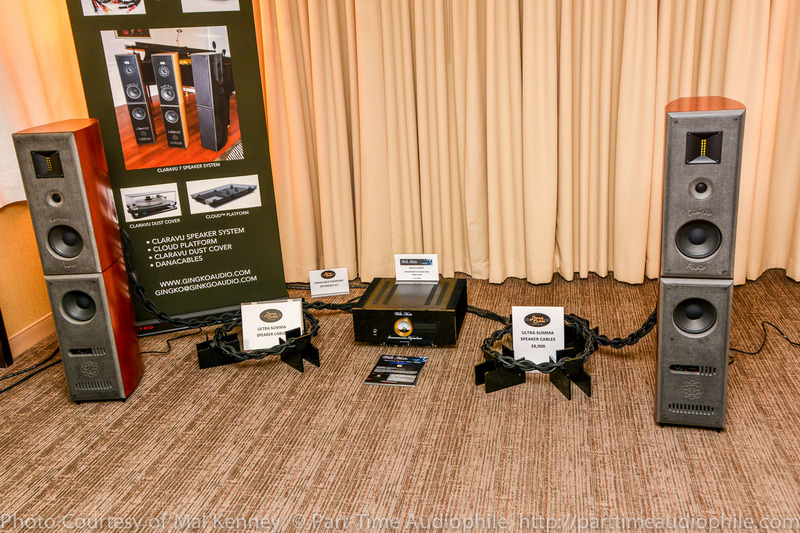 Part of that was almost certainly the Wells Audio Innamorata Signature amplifier ($15,000) that powered the top half of the speakers. The folks at Gingko would tell me that a big part of it was the full loom of Dana Cable that tied everything together (just over $12,000, if memory serves). But, really, it was all about how good Barbara Hendricks & the Magnus Lindgren Quartet sounded with “Trouble in Mind” from Barbara Sings the Blues. Barbara Hendricks isn’t all that young anymore, but her voice has aged into something close to an ideal huskiness for this album. There may have been a touch too much romantic breathiness in this system’s presentation, but that was hardly unwelcome. The real star, surprisingly, wasn’t the glorious presence that the system gave to Hendricks’ voice (I’m past being pleasantly surprised by the LampizatOr dacs), but the perfect scale, perfect timing, and superb control displayed with Mathias Algotsson’s piano. This was the kind of piano that I expect to hear from a big stat, not from a small column festooned with mismatched drivers. This was, to my taste, a brilliantly matched and implemented system.